Prepare for leadership and management roles in public and nonprofit organizations with a Master of Public Administration (MPA) degree from UNT. The mission of the Master of Public Administration program is to prepare leaders for public and nonprofit organizations through an innovative curriculum and dedicated teaching; creating and disseminating knowledge to the field of public administration through interdisciplinary research and professional development activities; and serving the profession and the community in order to promote democratic governance and enhance quality of life. The MPA program was established in 1961 and now has more than 1,400 alumni working in all forms of public service as well as the private sector. US News and World report ranks our local government specialization as the #8 program in the nation, #5 among all public universities, and #1 in Texas. We also have strong specializations in nonprofit management, public finance, emergency management, and human resources. Details about the program are below and in the UNT Graduate Catalog and the MPA Student Handbook Academic Year 2018-19. The MPA program accepts incoming cohorts for the Fall and Spring semesters. Please note that application materials for Fall 2019 will be accepted no later than July 31, 2019. The admission deadline for Spring 2019 semester is December 15, 2019. Application for admission to the MPA program is made directly to the Toulouse School of Graduate Studies using the online form by clicking the Apply Texas link below. 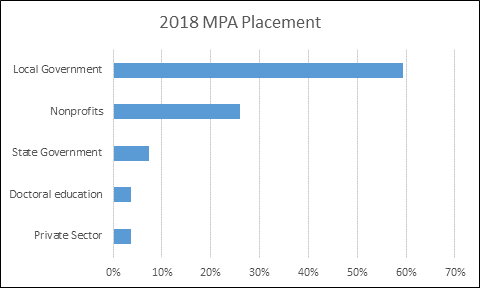 Be sure to select the major that says "MPA" in its title. The application fee is $75 and nonrefundable. Step 2: Submit transcripts to the Toulouse Graduate School. The transcripts must show you have earned a bachelor’s degree from a regionally accredited institution (or equivalent). Graduate applicants are evaluated holistically. If your undergraduate GPA is less than 3.0 for the last 60 hours of coursework, we strongly recommend the submission of additional supporting materials discussed below. The submission of additional supporting materials is not mandatory, but additional materials may strengthen your case for admission. The following are examples of materials that may strengthen an application portfolio. GRE scores for all three parts of the GRE General Test (verbal, quantitative, and analytical writing) is an important way to strengthen your application. We strongly recommend the submission of GRE scores if the applicant’s GPA is less than 3.0 for the last 60 hours of the undergraduate program. The GRE General Test is not required for admission to the MPA program, but some scholarships do require GRE scores. For students applying for scholarships, the GRE is required for many scholarship applicants. GRE scores for all three parts of the GRE General Test (verbal, quantitative, and analytical writing) should be taken. Request that official test score reports from the testing agency be sent to the Toulouse Graduate School. The UNT school code for the GRE is 6481. TOEFL scores or other evidence of English proficiency (such as IELI completion) for international students. Letters of recommendation attesting to intellectual and leadership abilities. A written statement by the applicant describing career objectives and explaining how an MPA degree will help meet those objectives. This should be 500 words or less. A current resume showing all work experience. Other evidence that demonstrates the applicant's ability to perform satisfactory work at the graduate level. Please submit any additional materials by mail to the following address or by email to MPA Admissions (this should be our mpa@unt.edu email address). Step 3: Complete the basic scholarship application. The MPA programs offers about $50,000 per year in scholarships. We strongly recommend that every applicant apply for a scholarship by completing the general scholarship application that takes about five minutes. Additional information is on the MPA Scholarship page. Various forms of financial assistance are available to MPA students directly from the department or from external sources. On an annual basis, students in the MPA program receive $50,000 from departmental resources. We recommend that students interested in financial aid investigate available options at the time they apply to the program since a number of scholarship/assistance opportunities are offered to new students only. Other scholarship are available to students who have begun their program, especially external sources. Please follow the instructions below to be eligible for departmental and college scholarships. Students can apply for multiple scholarships, but will be awarded only one departmental scholarship, which is the one of greatest monetary value. Go the UNT scholarship application page and complete the “General Scholarship Application.” You will need an EUID to begin this process. UNT usually sends your EUID within a week or so of the admissions decision. Start by clicking the Sign In box at the upper right corner of the page. Please note that Edge browsers may have problems with the link. We recommend you use either Chrome or Firefox. You may choose to complete the College of Health and Public Service application for additional opportunities. You are not required to complete this application however. One year scholarships ranging from $1,000 to $12,000. Deadline for applications is March 21st, but the review process begins on February 1st and awards are given until funding is exhausted. Applicants must be first-term students in the MPA program for Fall semester. Preference is given to students with a minimum GPA of 3.0. GRE scores are NOT required. Completion of the general scholarship application is sufficient for consideration. Recipients must be full-time students. Sponsored by the Texas City Management Association, the Ridley scholarship provides $3,500 for one year of study. Applicants should be in their second year of graduate study and be either a full or part-time student. Applicants should have a strong career interest in municipal management. The application deadline is usually mid-December and is made to TCMA. Established to provide support to MPA students in the Department of Public Administration who are completing a 440 hour internship with a qualifying small city or nonprofit organization. This scholarship is open to graduate students enrolled full-time in the MPA program in the College of Health and Public Service. Typical scholarship awards range from $500-$1,000. Award will be distributed as hourly compensation during the duration of employment. *All eligible students must maintain full time enrollment as established by the University, unless the student is nearing completion of their degree program and does not need full time enrollment. One time award of $1,000. Deadline for applications is February 1st. Applicants must have completed 30 hours in the UNT MPA program by the deadline. The recipient of this award is named the Outstanding MPA Student as selected by the faculty and announced at the annual alumni luncheon. Preference is given to students with a minimum GPA of 3.5 in the UNT MPA program. Completion of the general scholarship application is sufficient for consideration. Open to students enrolled full-time in the MPA program within the Department of Public Administration at the University of North Texas. Applicants must be beginning, full-time pre-career students interested in an administrative career in local government. Five scholarships are awarded each year by the department. The awards are for 18 months and are worth $27,000 each; $12,000 is awarded as a stipend and paid over 16 months ($750 per month), and the remaining $15,000 is applied toward tuition. For the first 12 months, students serve as research assistants to faculty members for 10 hours a week. The department begins reviewing applications April 1. Sponsored by the Government Finance Officers Association of Texas, an annual one-year award of $4,000 to a student interested in financial management. The application deadline is usually March or April and is made to GFOAT. One year scholarship worth $1,000 that is given for the subsequent Fall/Spring semesters ($500 each). Deadline for applications is June 1st. Applicants must have completed 18 hours in the UNT MPA program by June 1st. Preference will be given to applicants with a minimum program GPA of 3.5. Completion of the general scholarship application is sufficient for consideration. Recipients must be full-time students. One year scholarship worth $1,000 that is given for the subsequent the Spring/Summer semesters. Deadline for applications is November 1st. Applicants must be first-term students in the MPA program for Spring semester. Preference is given to students with a minimum GPA of 3.0. GRE scores are NOT required. Completion of the general scholarship application is sufficient for consideration. Recipients must be full-time students. The Gordon R. Carpenter Endowed Scholarship in Public Service provides scholarships for full-time graduate students majoring in Public Administration at the University of North Texas who meet the minimum entrance and continuing academic performance standards of the Department of Public Administration. Established to honor Gordon R. Carpenter, 1940 graduate of UNT with a Bachelor of Science degree in Government and Economics, for his public service to the North Texas region and the nation, the scholarship is open to MPA students in good academic standing and who demonstrate a commitment to public service. This scholarship may be awarded to a previous recipient on an annual basis if the recipient reapplies and continues to meet eligibility requirements. Graduate students are advised by department faculty. Program coordinator Skip Krueger can help connect you with potential faculty advisors based on your unique interests. Tuition and fees for the program can be calculated at the https://admissions.unt.edu/tuition-costs-aid. The cost for Fall 18/Spring 19 is about $3,800 per semester for tuition and fees for 9 hours. The program core consisting of eight required courses that provide the basic concepts and methods of public administration plus, for pre-career students, an internship. The program furthermore consists of a set of electives suited to the student's career interests or an optional specialization designed to develop expertise in a particular substantive area. Details are found in the MPA Student Handbook Academic Year 2018-19. Students with extensive and upper level management work experience in the public sector may be exempted from three hours of electives. An internship is required for students with no public sector experience. Internships provide an opportunity to apply the classroom experience in a government agency or nonprofit organization. The internship requires 440 contact hours and it must be a paid. Students with relevant work experience may be exempted from an internship upon review by the MPA coordinator. The final degree requirement is successful completion of a comprehensive exam. Students wishing to take the exam must have completed at least 30 hours of their graduate degree program and all core courses except PADM 5035. Students graduating with a UNT MPA are exceptionally competitive in the public sector job market. Our placement rate six months after graduation is more than 90% on average. Our program’s strength is placement in municipal governments, but our reach extends to state, federal, and even national governments in other countries. Our placement in nonprofit organizations is strong and our scope extends to the private sector as well. With an active alumni network, we start the program with the goal of your finding a rewarding career path whether you are a pre-career or mid-career student. +Is this a good program and school? 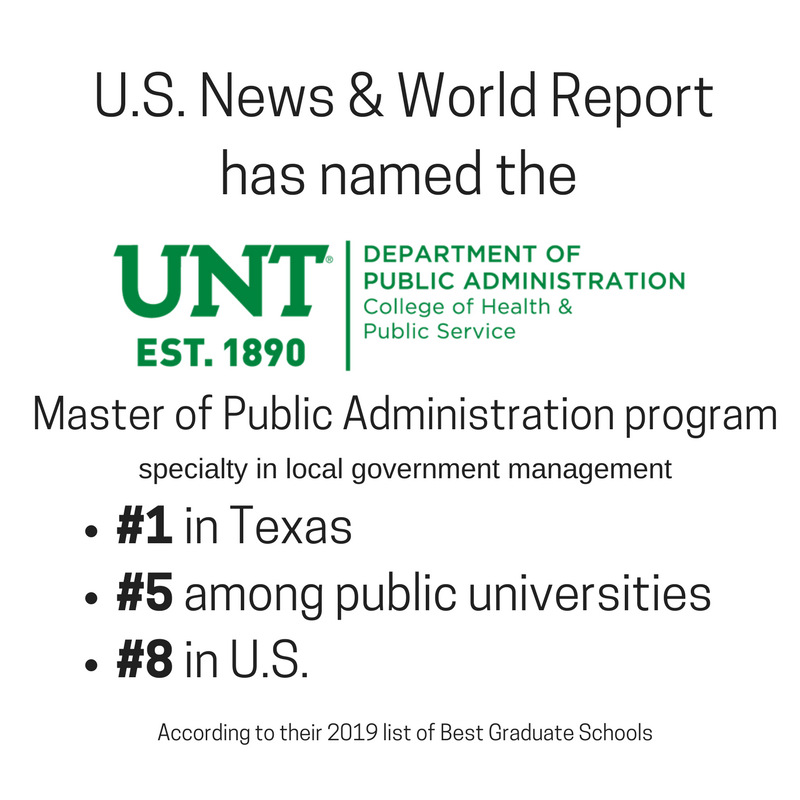 U.S. News and World Report ranks the MPA program at UNT as the best in Texas and the Southwest, and 13th in the nation, in the area of city management and urban policy. Our MPA degree is also accredited by the Network of Schools of Public Policy, Affairs, and Administration (NASPAA), which is the national accrediting association for graduate public administration programs. Our MPA degree provides you with a combination of time-tested management theories and state-of-the-art practice. The program's curriculum emphasizes such timely and critical developments as measuring organizational performance, evaluating public programs, working in teams, understanding up-to-date financial reporting requirements, operating in collaborative networks, planning for and managing disasters, leading nonprofit organizations, encouraging workplace diversity, and many others. +Can I get a real job...or a better real job? Graduates of our program get jobs. Our network of alumni and employers in Texas and beyond is extensive, and when a prospective employer sees "University of North Texas MPA" on your resume, they will be confident that you have the best possible education in public management. Because we emphasize general management skills and help you determine how and where you can apply them, your career options are not limited to any one policy area or level of government. Our program is distinctive because it provides the tools that offer you as much flexibility as you desire. We don't believe a degree should limit your options; we believe an MPA should open up a world of opportunities. +Do I have to quit my day job? You won't have to put your life on hold while you get your MPA from UNT. We offer most of our courses in the evening or afternoon. We offer some courses online and in a hybrid mode. This is not an online only program. We believe that interaction with faculty and your colleagues is critical to developing knowledge, abilities, and networks that make our graduates successful. +Will I need a day job? Pre-career students are required to serve an internship before graduating, but you will not be doing menial tasks for free. We want you to have a meaningful internship experience and we expect you to be compensated for the expertise you bring to the employer. We require all internships to provide income for the student, usually an hourly wage. You will also take a preparation course to assist you in resume development and interviewing skills. +How long will this degree take? If you are a full-time student, you can graduate in 22 months. If you are a part-time student, you will be able to tailor your class schedule to fit into your busy schedule, but we expect all students to graduate within three years. Many students obtain full-time positions before the end of their program and change from full-time to part-time students. However, full-time students will have all the course offerings needed to complete the program in four long semesters and one summer session.